First: the screen. Many of Acer’s Chromebooks have, historically, been hampered by their poor displays. Thankfully, this time, Acer has gotten that part right. The Chromebook 14 has a 1080p IPS display with fantastic viewing angles and excellent brightness. I keep it at about 60-70% and it looks fantastic. It feels wonderful to finally say that about an Acer display. 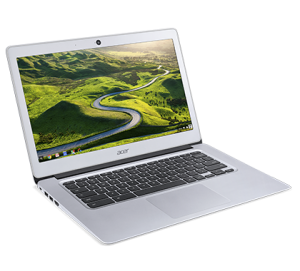 More information about the Acer Chromebook 14 on Acer website. Second: the build materials. Chromebooks have generally been budget-friendly devices, but recently we’ve started to see some that are either mid-range and high quality (like the Dell 13) or are upper-low end budget devices that still use more premium build materials, like the Asus C100P “Flip” and now, the Acer Chromebook 14. Note that I said build materials, and not build quality. Third: 4GB RAM, 32GB local storage. A more recent trend among Chrome OS devices is the inclusion of 4GB of RAM and 32GB of storage, instead of the 2GB/16GB to which we’ve become accustomed. For a lot of users, the local storage limitation isn’t a big deal, as without applications, local storage isn’t that critical… but it is nice for people who like to locally store music, photos, and movies, or who intent to install Crouton (or are looking ahead to the possibility of Android apps). The extra RAM, however, is great for everyone, as it makes this device more capable of running many tabs, or handling higher demand tasks like streaming content, without tabs crashing out or caching/reloading. Fourth: Intel N3160 quad-core processor. This processor isn’t exactly going to light the world on fire, but for most of what folks do with a Chromebook, it is going to be adequate, and it provides a user experience that feels significantly faster and more responsive than the N3050 on Windows 10 or Chrome OS, and is also more responsive in Chrome here than the x5-Z8300 is in Windows 10 (such as you’d see in the Intel Compute Stick or Asus E200HA).